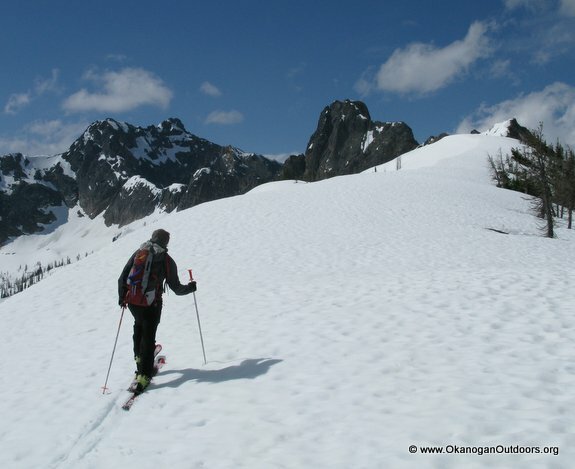 Throughout Washington State, backcountry skiers know that the mountains flanking the North Cascades Scenic Highway (Highway 20) near Rainy and Washington passes provide some of the country’s premier ski touring. 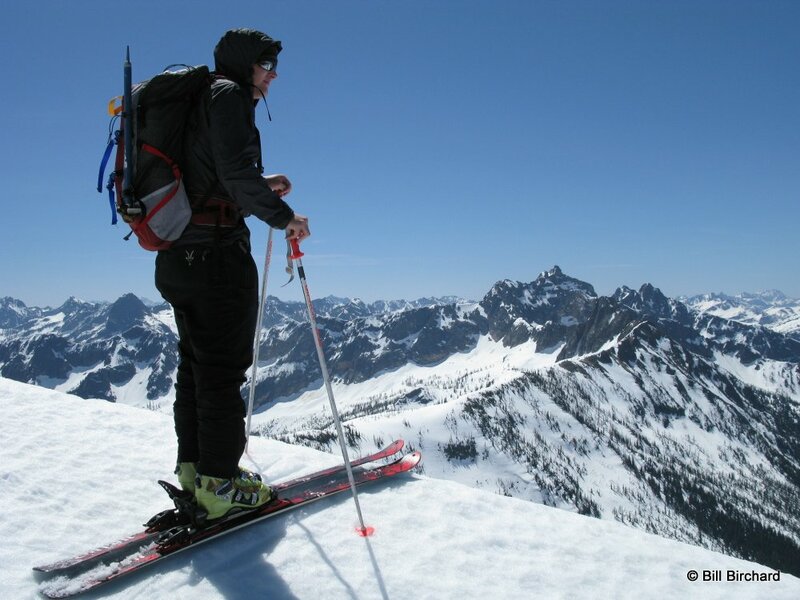 Jake Birchard skiing from Cutthroat Pass toward Cutthroat Peak. The massive avalanches that overrun the road in winter and the absence of large population centers east of the mountains shut down the highway throughout the winter months. In spring (sometime between early-April and late-May depending on the winter snowpack), the highway is plowed and immediately ‘they’ come. Mainly ‘they’ come from within the state and ‘they’ come on weekends. 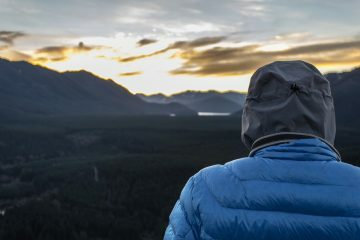 They may come for short day tours (Blue Peak or Spire Col) or for medium-length loops (The Birthday Tour) or for long day climb (Black Peak) or for multiday traverses (the Isolation and Ragged Ridge traverses), but they come. 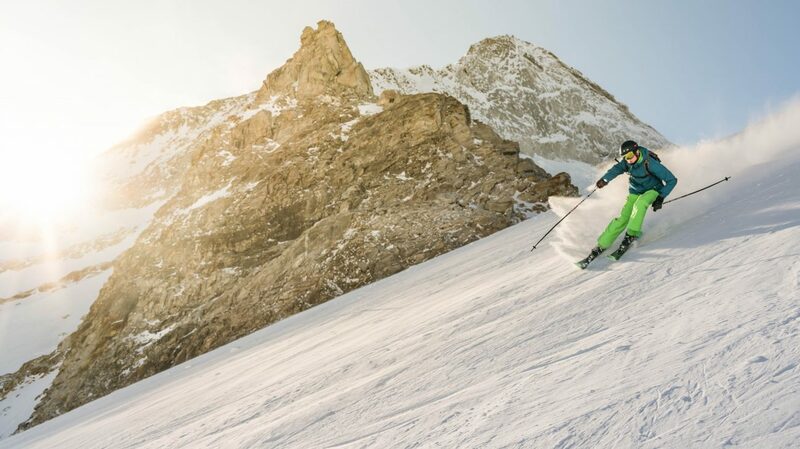 Gradually, the word has gotten out that the abundant and easy access to snow, wild scenery, freeze-thaw corn conditions, and long spring-summer season make Rainy and Washington Pass must-ski destinations. So now ‘they’ includes a few from far corners of the country. 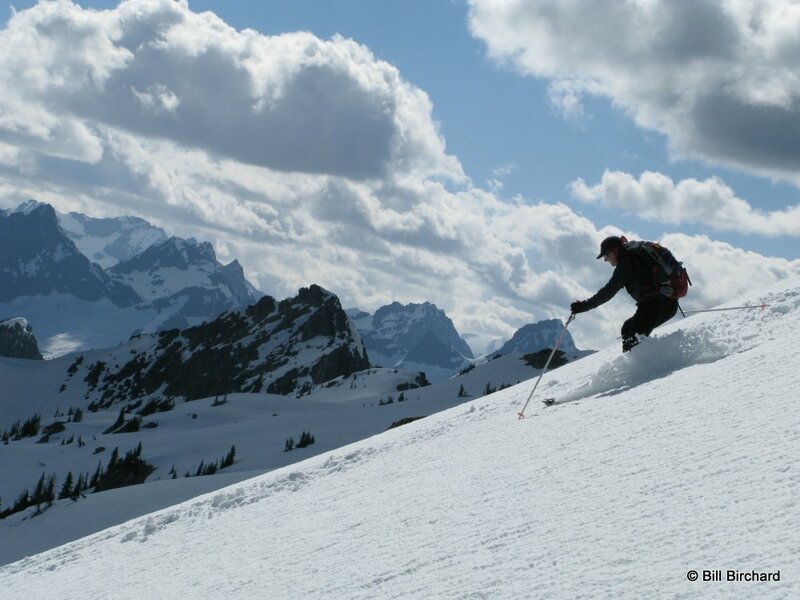 Recently I skied the Rainy Pass area with Bill Birchard, 58, of New Hampshire who has ski toured a number of times in the Alps and who owns a second home in Golden, BC so he can tour Rogers Pass and the Canadian Rockies. He was accompanied by his son Jake, 25, who lives in Colorado Springs where he can ski, climb, and kayak year-round. Naturally I wanted to know from well-traveled skiers how our North Cascadian stomping grounds stacked up. 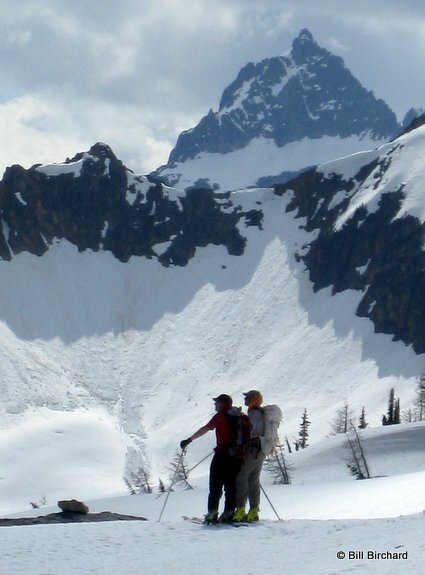 The North Cascades receive their share of avalanches. This slide took the ‘primeval’ out of this stand of trees. The short answer: Pretty darn well. 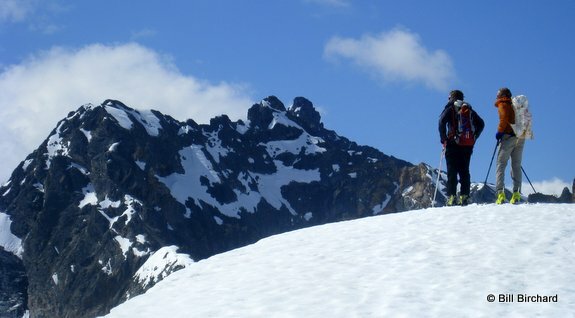 The total relief fell short of the Alps and the Selkirks, but the total experience did not. Big peaks & big views in the regional backyard. I’m already enamored with this country, but hearing such praise makes me all the happier to stay home and explore the regional backyard. Access. From Winthrop, drive State Highway 20 about 36 miles west to Rainy Pass (Milepost 157.5) and park in one of the pullouts on either side of the highway. 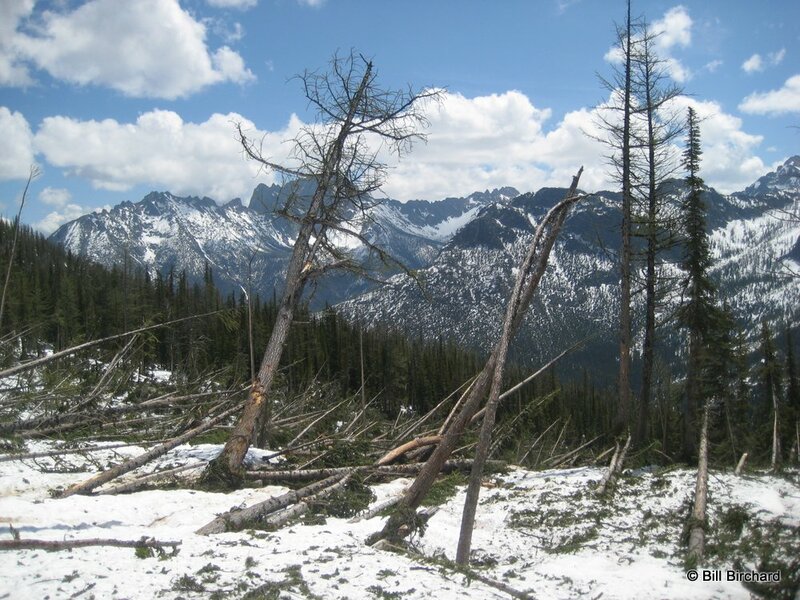 A Northwest Forest Pass is required during hiking season when the parking areas are snow-free but not in late spring and early summer when the parking areas are snow-covered. A secondary, more direct pullout for parking when skiing up Porcupine Creek is 0.75 miles west of Rainy Pass (milepost 156.75) on the south side of the highway. 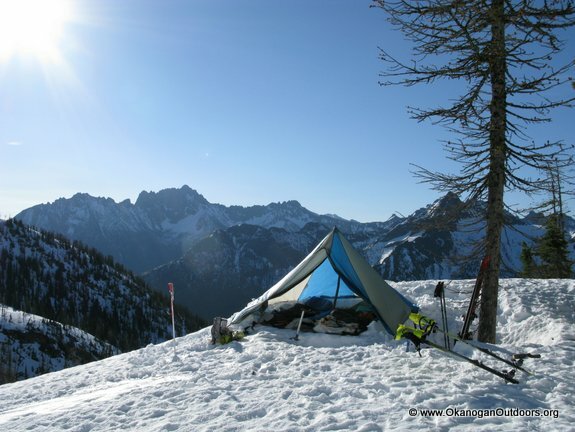 This pullout is a little lower than Rainy Pass but provides an easier approach if the Pacific Crest Trail is still snow covered. Map: See our topo map of the area. 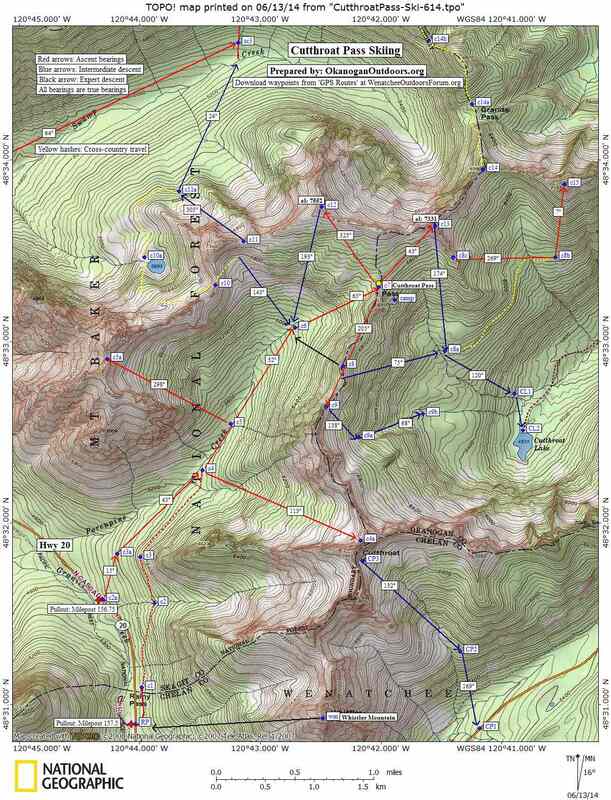 GPS: Download a GPX File (CutthroatPassSkiing.gpx) with waypoints listed on our map. If starting from Rainy Pass, follow the road on the north side of the highway 0.3 miles to the summer parking. Pick-up the Pacific Crest Trail here and follow it north as it slowly climbs but mainly contours for a mile toward the Porcupine Creek drainage. When snow is still cover the access road and the Pacific Crest Trail, it’s not particularly easy to follow the trail so the lower start is actually recommended. If starting from the lower pullout, follow a true bearing of 15 degrees up to the 5000-foot level and then a true bearing of 45 degrees to the 5320-foot level (waypoint c4). If using the lower pullout out, the trees will be thick to navigate for the first few hundred feet. Once away from the road, the travel improves greatly. The Pacific Crest Trail intersects Porcupine Creek at waypoint c4 (elevation 5320 feet). If the ground is snow-covered, don’t bother crossing the creek, just work up the drainage along the southeast side of the creek generally following a true bearing of 32 degrees. At the 6000-foot level (waypoint c6), follow a true bearing of 65 degrees to Cutthroat Pass (c7). 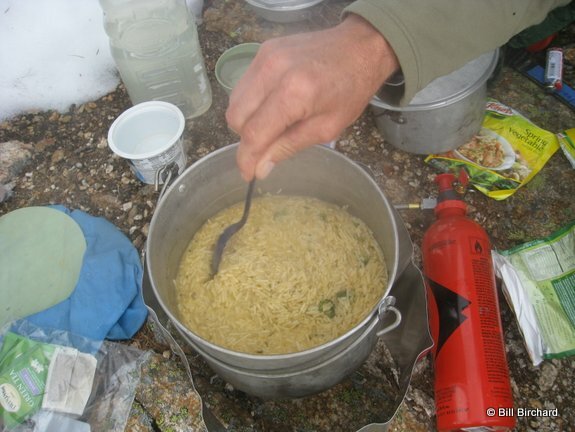 If camping, keep in mind the pass will be windy. A nice knoll that is much more wind protected is over and downhill of the pass (southeast of the pass and downhill about 200 vertical feet). Keep in mind that large cornices can form on the peaklet above this knoll so gauge the cornice hazard carefully before deciding where to set up camp. From Cutthroat Pass you’ll have a few days’ worth of moderate-angled peaklets and bowls to ski. The largest peaks, like Cutthroat Peak, have sheer rock pyramids capping them but peaklets 7552, 7331,6990 and 7157 (see map) all have fun ski runs. 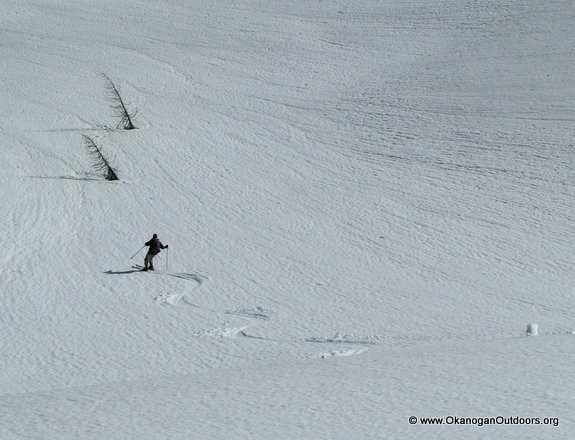 Before the snow level is pushed up too far, the ski descent down to Cutthroat Lake can be fun. Likewise in April and early May before snow has burnt off lower south-facing slopes, a long day trip can lead over the pass at waypoint 11, drop to Swamp Creek, climb to Snowy Lakes, and then ski up the beautiful slopes leading to the spiky thorn of Golden Horn (the last bit to the summit of Golden Horn has a pitch of easy 5th class climbing). A camp just below Cutthroat Pass. Below: This is country that makes all food taste good. Reporter (and date). First posted 6/13/2014 by Andy Dappen. More Ski Tours. 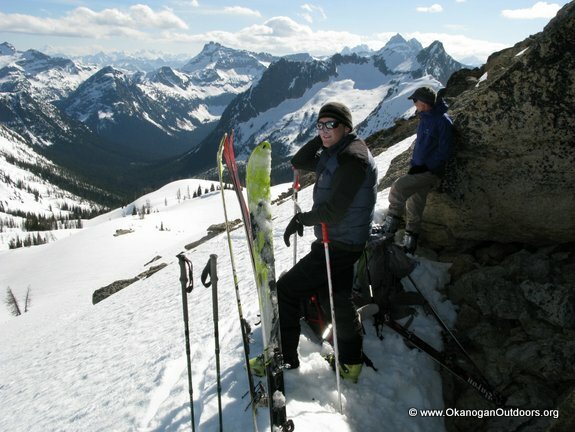 See the Skiing-Backcountry guidebook for more ski trip options around Okanogan county. 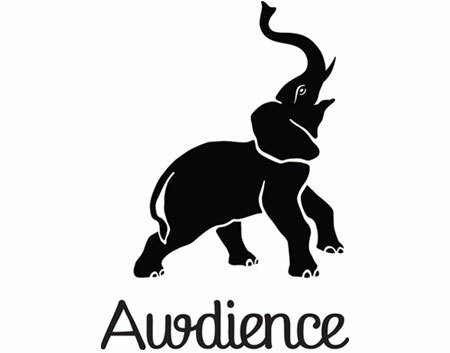 This post was originally published on 6/13/14.